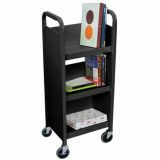 Book trucks are made of all welded steel and roll on 4" casters. Trucks are 42"H. Specify black or putty. 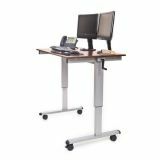 The innovative sit-to-stand desk has a crank that allows for effortless adjustment from sitting to standing. 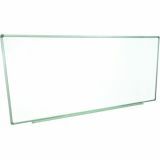 Double-sided reversible whiteboards with silver frame. 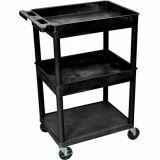 Roll on casters. Includes 10-year warranty on board. 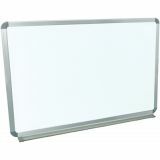 Luxor wall-mounted whiteboards are magnetic and available in three sizes. 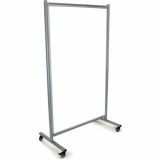 Painted steel magnetic whiteboard includes mounting brackets and hardware. Aluminum frame around the board has a 2" deep aluminum tray to hold dry eraser and markers. 10 year warranty on the board. Hardware provided is for drywall installation. 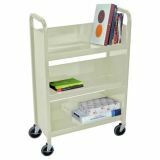 Made of painted steel with chrome-finished aluminum frame enclosing whiteboard. 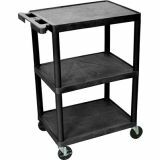 Both sides of the reversible whiteboard are magnetic and measure 38 1⁄2"W x 64"H. Rolling whiteboard features four casters, two with locking brakes, for easy maneuverability and stability. 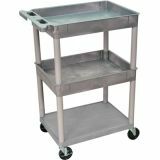 Measures 43"W x 24"D x 75"H with frame. 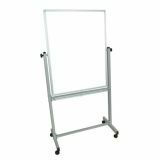 Luxor MB whiteboard series are made from magnetic reversible whiteboards with chrome finish on main frame. 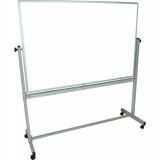 Available in three sizes, the boards feature a silver frame around the whiteboard series. 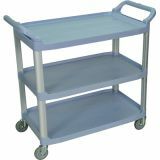 Includes 4 casters for easy mobility. Boards lock into place when in position. Frame base is 23"D. Assembly required. 10 Year Warranty on Board. Ships in two cartons.